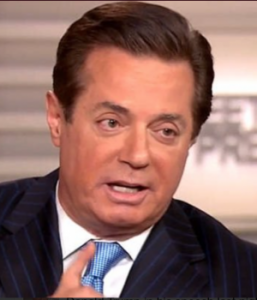 WASHINGTON – A federal judge ordered former Trump campaign manager Paul Manafort jailed Friday over witness-tampering allegations that she said violated his terms of release. Judge Amy Berman Jackson of the U.S. District Court for the District of Columbia granted a request by Special Counsel Robert S. Mueller III’s team to revoke Manafort’s $10 million bond and jail him as he awaits criminal trial next month on conspiracy and money-laundering charges. Jackson said probable cause existed that Manafort, 69, had repeatedly contacted two witnesses to try to influence their testimony in Mueller’s Russia investigation. She called the decision to detain Manafort “extraordinarily difficult,” but cited numerous federal court precedents for detaining defendants who violate terms of release, including committing no crimes. Manafort’s attorney, Richard Westerling, asked Jackson to impose less-restrictive conditions than his current $10 million bail and home detention with electronic monitoring. Westerling suggested the judge impose an order that Manafort not contact witnesses instead of incarcerating him. But prosecutor Greg Andres told the judge no conditions would keep Manafort from attempting to influence witnesses. Marshalls led Manafort, wearing a blue suit, out of the courtroom without handcuffs. He waved to his wife as he was escorted to be taken to jail. Manafort faces criminal trials in Washington and Virginia based on Mueller’s team’s allegations that he worked as an unregistered lobbyist for the pro-Soviet government of the Ukraine, laundered more than $30 million and committed tax fraud and bank fraud. Last Friday, Mueller’s team indicted Manafort and his associate Konstantin Kilimnik, who prosecutors said has ties to Russian intelligence, on charges of obstruction of justice and conspiracy to obstruct justice. The indictment alleged Manafort and Kilimnik attempted to persuade two witnesses to tell investigators that the Ukraine lobbying occurred in other countries but not in the U.S.
Richard Gates, a former Manafort business partner and Trump campaign aide, had pleaded guilty in February to conspiracy and lying to federal agents. Gates is cooperating with Mueller’s team.